My name is seahorsejoanna and I have won 3 times the 10000+ NP and a rare item on the Coconut Shy game. The rare item is a coconut to add to your stamp, coin and coconut collection. If sold, some go for huge amounts of neopoints. I won on the 22nd, 28th and 29th of June 2006. Here are my screenshots (with month written in French as I live in France). Now... how did I win? I always go for the same coconut all through the game. To keep the same aim through the whole game, I have a technique. Explanation: I always point my cursor to the center of the "a" of "again". This allows me to always throw toward the middle coconut. I hit it almost every time. But you need to keep checking your cursor hasn't moves and is still pointing to the "a" of "again". Sometimes you may have a correct aim but the ball with go left of right. It happens every game. I win 50 NP mostly (which is not a gain) then 300 NP (which compensates for the money lost) and in ONE MONTH I won the 10000 Jackpot THREE TIMES!! It has also been reported that luck may be increased on your birthday. This birthday theory may or may not be true. 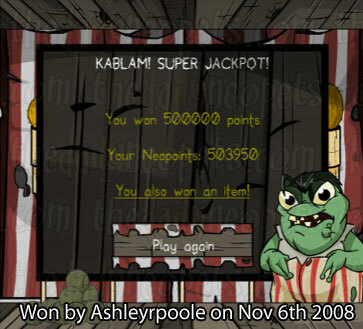 So it's up to you if it's worth loosing a bit to maybe win a lot... when the coconut explodes you earn 500,000 Neopoints as reported by Ashleyrpoole!